· Those with less than four open water dives in the past year. · Those with no open water dives in the past six months. · Those planning dives in a new environment. · Certification date, level, agency. · Date of last refresher or dive. · Review of log or training record and dive experience. 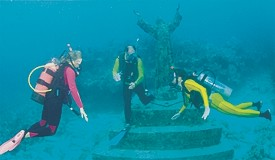 · Recent changes in equipment and technology and review of basic dive skills. · Review of the dive tables and “no decompression stop” limits. · Local procedures and environmental factors. 1. Do I receive certification for this course? No certification is issued for this program; however, upon successful completion the instructor will stamp the student’s logbook to verify that this training has taken place, which will allow the diver aboard commercial dive boats. This program may also be used to upgrade Junior Open Water SCUBA Diver to Open Water SCUBA Diver, once appropriate age has been obtained, with new C-card (at additional cost). 2. How much does a refresher course cost? The "Dive Refreshed" course is only $195.00, which includes instruction in the classroom and in the water, pre and post dive briefings, and all necessary equipment. 3. What equipment will I need to "Dive Refreshed"? Students should provide the equipment they will be diving with in open water. The Instructor will review equipment for fit and functionality, including whether it is appropriate under current standards and has been properly maintained. Rental equipment is included, if necessary, at no additional cost. 4. What reference materials should I have? Check the Course Schedule and email Enroll@ScubaConn.com or call 203-952-8679 to enroll! Course enrollment forms can be downloaded HERE.